These 10 teams never got to play for a national championship, but plenty felt they should have. Twenty years after the first BCS ranking, we recognize the best teams from that era to fall one spot short of a title game bid. For 16 years, calls of “We were snubbed” echoed across college football as fans longingly watched another team play for a national championship while their team sat at home. Historically, the sport is no stranger to postseason controversy—witness 1973 Michigan, which was held out of the Rose Bowl by a vote in favor of archrival Ohio State—but no other system consistently broke the hearts of fans quite like the BCS. As the BCS’s 20th anniversary arrives, we rank the 10 best No. 3 finishers in the rankings, the teams that almost went down in history and maybe could have made noise if the four-team playoff had arrived earlier. 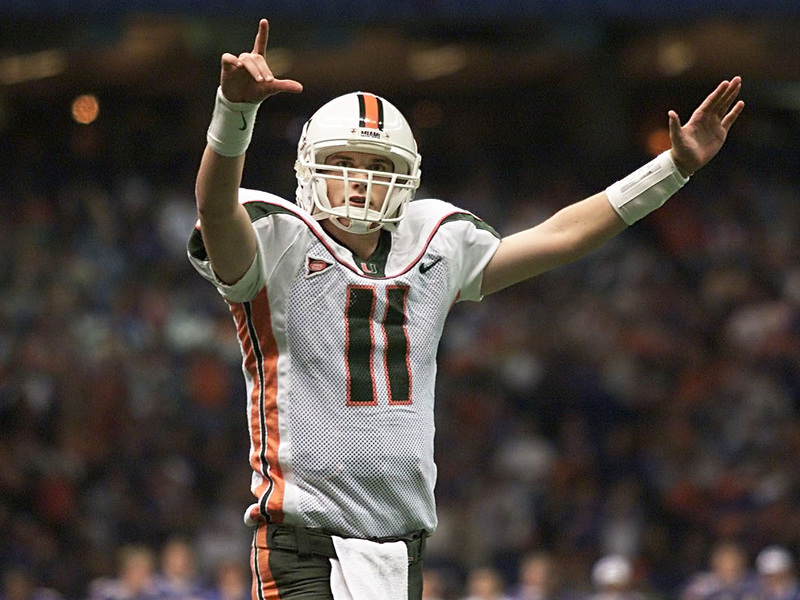 There are more snubs worth mentioning like Joey Harrington–led 2001 Oregon, which finished fourth despite a late push to crack the top two, or the 2009 Boise State team that rolled to a 14–0 season but hit a ceiling of sixth in the rankings. This exercise is limited to picking a No. 1 out of the 16 teams that landed at No. 3. Alabama was ranked No. 1 for the first 11 weeks of the 2013 season, only to see its chances of winning a national title evaporate as Chris Davis went sprinting down the Auburn sideline and into college football history. Reeling from the Kick-Six, the Tide were awarded an at-large BCS bid to the Sugar Bowl to face off against Oklahoma, but that felt like a let down for a team which expected to play for a national championship. Quarterback Trevor Knight shredded the Alabama defense on the way to a 45–31 Sooners victory. This is the only team on this list to not win its bowl game, but Alabama had been impenetrable prior to its final two games of 2013. The defense held opponents to 10 points or less in nine out of its 11 games and pitched three shutouts. They were not flashy or exciting, but they got the job done. Led on offense by punishing runners Tony Hunt and Michael Robinson, Penn State averaged 235.5 yards per game on the ground. On defense, the Nittany Lions were anchored by eventual All-Pro defensive end Tamba Hali. Penn State’s only slip-up was a 27–25 loss to Michigan, where the officials put time back on the clock that allowed Chad Henne to find Mario Manningham for a last-second touchdown. The Nittany Lions would finish the season 11–1 and outlast Florida State in a triple-overtime Orange Bowl victory. Oklahoma State had a 4,000-yard passer in Brandon Weeden, a 1,500-yard receiver in Justin Blackmon and a 1,200-yard rusher in Joseph Randle, carving up defenses on the way to a 12–1 season. Unbeaten and ranked second in the country deep into November, the Cowboys appeared to be a lock for the national title game if they could get past rival Oklahoma in the season finale. Much to the college football world’s surprise, Oklahoma State stumbled before Bedlam, losing in double overtime at Iowa State. The Cowboys turned around and dominated their rivals the next week 44–10, but that wasn’t enough to leapfrog Alabama back into No. 2 for a chance to play LSU in the title game. As the controversy raged, they finished the season with a 41–38 overtime win against Andrew Luck and Stanford in the Fiesta Bowl. Lefty quarterback David Greene and dominant pass rusher David Pollack led the Bulldogs to a 13–1 season and a Sugar Bowl victory over ACC champ Florida State, with Greene throwing for 2,924 yards and 22 touchdowns and Pollack finishing with 14 sacks. Their only loss came by a touchdown to Florida in the World’s Largest Outdoor Cocktail Party, paving the way for Ohio State to topple Miami in the national title game. If it hadn’t been for a four-point loss to Texas in Austin, Nebraska may have had a BCS title to go with its split national title in 1997. Eric Crouch, who went on win the Heisman Trophy in 2001, led a dominant option attack that amassed 265.9 rush yards per game. The Cornhuskers went on to avenge their loss to Texas in the Big 12 championship game and capped the season off with a Fiesta Bowl win over No. 6 Tennessee. Before UCF disrupted the playoff conversation but after Boise State arrived to demand a seat at the table for mid-majors, there was this TCU team. Led by quarterback Andy Dalton and a tenacious defense, the Horned Frogs breezed through the competition in the Mountain West. But the BCS felt that the Horned Frogs’ strength of schedule was not enough to have a title shot, and they landed in the Rose Bowl opposite Big Ten co-champion Wisconsin. They pulled off a tight 21–19 victory to finish 13–0, leaving us to wonder how they would have matched up with title-game participants Auburn and Oregon. The 2003 season is one of the seasons that can be pointed to as the death of the BCS. At the end of the year, three one-loss teams were in contention: USC, LSU, and Oklahoma. USC was atop both the AP and Coaches' polls, while LSU was No. 2. The logical choice would be to have those two duke it out on the field to determine a champion, right? Wrong—the BCS chose to go with No. 3 Oklahoma over the Trojans. That being said, USC was an excellent team. Led by two future Heisman winners, Matt Leinart and Reggie Bush, the Trojans sliced through defenses with a dynamic passing and rushing attack on their way to a Rose Bowl win over Michigan and an AP national title. Their only loss came to Cal in triple overtime, a team led by a little-known JUCO transfer named Aaron Rodgers. The most important position on the field is quarterback, and when yours passes for 3,859 yards and 34 touchdowns with nearly a 77% completion percentage, your team normally succeeds. Colt McCoy laid waste to defenses in the 2008 season, leading the Longhorns to a 12–1 season. If it hadn’t been for the late-game heroics of Graham Harrell and Michael Crabtree in Lubbock to deal Texas its only loss and force a weird three-way tie for the Big 12 South that sent Oklahoma to the conference title game, this Texas team would have been in position to play for a national title. The Longhorns had four wins over top-11 opponents and finished their season off with a win in the Fiesta Bowl over No. 10 Ohio State. The Hurricanes were loaded with NFL talent: Ed Reed, Jeremy Shockey, Jonathan Vilma, Clinton Portis. Controversy swirled around this season, as Florida State, which Miami beat earlier in the season, was chosen to play in the BCS championship game instead. An early-September loss to eventual Rose Bowl champ Washington held Miami out of the national title game, but Butch Davis’s squad rattled off 10 straight wins to start the program’s record 34-game unbeaten streak and topped No. 7 Florida in the Sugar Bowl. A backfield of SEC Offensive Player of the Year Jason Campbell and two top-five NFL picks in Ronnie Brown and Cadillac Williams complemented a punishing defense that only gave up 173.5 yards per game to help the Tigers run the table in the SEC on their way to a 13–0 season and a Sugar Bowl win over Virginia Tech. Auburn had five wins over top-15 teams, surpassing the total between USC and Oklahoma, the teams that eventually played in the BCS championship game. The rankings snub made the BCS a dangerous enemy in SEC commissioner Mike Slive.